Colin Cheer claimed 4-27 for Bourne against Woodhall Spa. Market Deeping appear to have confounded their critics and doom mongers. Written off as relegation certainties in the Lincs Premier Division by some big local names a few weeks ago, Deeping have promptly won their next three matches to pull 40 points clear of the drop zone with six matches to go. Boston were their latest victims yesterday (August 5). Deeping won by four wickets after restricting the home side to 160-9. 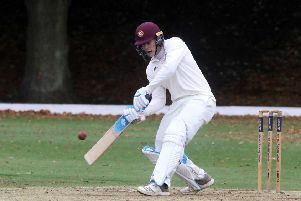 On a turning pitch off-spinner Zac Simmonds returned remarkable figures of 4-13 from 14 overs, while left-arm slow bowler Jackson Andrews picked up 4-33. Gifted teenage opener Nick Green’s run-a-ball 50 and a more sedate unbeaten 28 from Dave Gillett saw Deeping home. Spalding going down however remains a safe bet. They were predictably crushed by 170 runs at leaders Bracebridge Heath after conceding 249-4 in just 38 overs. Spalding replied with 79 all out with only Josh Newton (17) reaching double figures. Extras top scored with 20. And Bourne’s title challenge is over after they suffered a second defeat in a row, this time at the hands of Woodhall Spa in a low-scoring affair at the Abbey Lawns. Bourne looked set fair for victory at half-time as Woodhall were dismissed for just 136, but the home side were soon reduced to 42-8 and 74-9 and only a last-wicket stand of 41 between Ben Stroud (40no) and Colin Cheer got them to within 21 of their visitors. Earlier Cheer (4-27) and Stroud (2-15) had also bowled well, but Woodhall managed to recover from 43-5. Bourne are taking on Notts champions West Indian Cavaliers in a Midlands heat of the National T20 Cup at Wellbeck CC today (August 6). They would also play a final if beating Cavaliers. Market Deeping 161-6 (N. Green 50). Woodhall 136 (P. Chanditha 43, H. Wilson 34, C. Cheer 4-27, J. Berry 3-47, B. Stroud 2-15). Bourne 115 (B. Stroud 40no, J. Irving 6-42). Bracebridge 249-4 (M. Lineker 128, F. Javed 2-27). Spalding 79 (M. Knights 3-13, A. Carter 3-15).